The 2014–2015 eruption of the Nakadake first crater at Aso Volcano in southwestern Japan was characterized by continuous ash emissions and intermittent strombolian eruptions. In this paper, we present the distribution, discharged mass, and components of tephra-fall deposits to examine the sequence of activities. We installed 21 ash samplers around the crater (SW crater rim to 9 km in all directions) and calculated the mass of ash-fall deposits based on 28 isomass maps. From November 25, 2014, to the end of January 2015, the cumulative erupted mass increased at a high discharge rate (2.2 × 104 tons/day). After February 2015, the cumulative erupted mass decreased to a low rate of 0.6 × 104 tons/day, although this rate rose slightly in March and late April 2015. The 2014–2015 tephra-fall deposits consisted of glass shards, crystal, and lithic grains. In the November 25–27, 2014 ash-fall deposits, lithic fragments, which are interpreted to be derived from lavas or pyroclasts of previous eruptions, were dominant (59–68%). 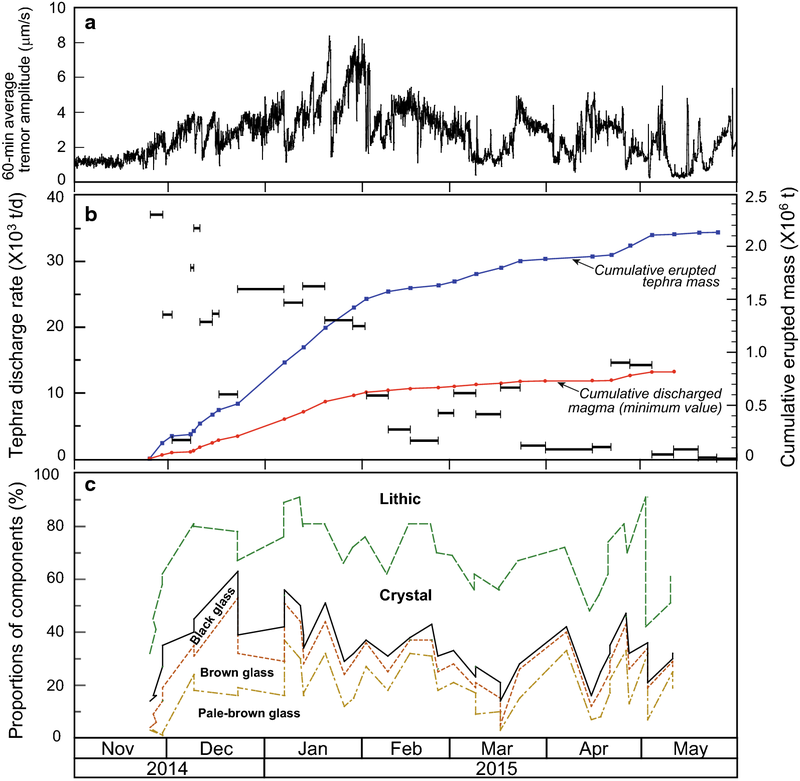 Thereafter, the proportion of glass shards, which are probably juvenile materials of newly ascending magma, gradually increased with time, and the December 21–23, 2014 ash contained abundant glass grains (63%). The proportions of glass shards ranged from 29 to 50% until February 25, 2015. Subsequently, they decreased with time and reached 14% on March 17. Afterward, the proportions increased again prior to April 27 and ranged between 20 and 30% in May 2015. The total erupted tephra mass from the November 2014–May 2015 activity of Nakadake first crater was 2.1 × 106 tons (1.2 × 104 tons/day), which was less than the tephra deposits of previous activities that have occurred within the past few decades. The online version of this article ( https://doi.org/10.1186/s40623-019-1018-6) contains supplementary material, which is available to authorized users. Small eruptions including gentle ash emissions, strombolian, and vulcanian eruptions frequently occur at basaltic to andesitic volcanoes worldwide (e.g., Ono et al. 1995; Taddeucci et al. 2002; Andronico et al. 2008; D’Oriano et al. 2011; Iguchi et al. 2013). Although these activities rarely cause fatalities, they produce fallout tephra deposits continuously or repeatedly for a long time. Local inhabitants, infrastructure, and agriculture in the surrounding areas are greatly affected by these activities. It is therefore very important to clarify the distribution and components of the tephra-fall deposits to estimate their effects around the volcanoes and plan hazard mitigation. Many previous tephra studies have focused mainly on medium- to large-scale eruptions (VEI > 2), including plinian and sub-plinian eruptions (e.g., Fierstein and Hildreth 1992; Miyabuchi et al. 2013). In contrast, detailed geological and petrological studies on small-scale eruptions (VEI < 2) and related deposits are limited by the poor nature of such eruptive deposits because they are rarely well preserved after the eruptions due to their paucity and fine-grained nature. Obtaining information on the mass and component characteristics of erupted materials is fundamental to understanding the sequence of events and mechanisms involved in these eruptions. However, few continuous observations of ash-fall deposits during one active period lasting a few months to a few years to elucidate temporal variations in the masses and components have been performed, except for some examples at Sakurajima Volcano (Nakamura 2002; Shimano et al. 2013; Miwa et al. 2013; Oishi et al. 2018). The Nakadake first crater at Aso Volcano, which is one of the most active volcanoes in Japan, began a series of magmatic eruptions on November 25, 2014, and continued to May 3, 2015. The eruptive activity was dominated by continuous gentle ash emissions and intermittent strombolian eruptions. The most typical volcanic activity of the Nakadake first crater within the last few decades has been the continuous fallout of black sandy ash derived from the solid glassy top of a magma column (Ono et al. 1995). This activity, called an ash eruption, has continued for more than 10,000 years (Ono et al. 1995; Miyabuchi 2009), and the eruptive deposits distributed around the volcano are composed mainly of fine-grained ash-fall deposits rather than coarse-grained scoria-fall deposits. This fact indicates that most of the magma beneath the Nakadake Volcano has been discharged as fine-grained ash due to small-scale eruptive activity that has lasted for at least 10,000 years. We undertook fieldwork in and around the Aso caldera from November 2014 to May 2015, to examine the distributions and characteristics of tephra-fall deposits associated with the 2014–2015 eruptions of the Nakadake first crater. We present here the distributions, discharged masses, and components of the related deposits, and discuss the sequence and characteristics of the series of eruptions. Nakadake Volcano is the only active central cone in the Aso caldera, central Kyushu. A composite volcano of basaltic andesite to basalt, Nakadake became active from ca. 22–21 ka (Miyabuchi et al. 2004) and consists of an old edifice (agglutinate and lava), a young edifice (pyroclasts and lava), and a still younger pyroclastic cone (Ono and Watanabe 1985). The old volcanic edifice is the main cone of Nakadake Volcano, rising approximately 900 m from the caldera floor. The upper part of the edifice is a complex cone made largely of welded spatter, with subordinate amounts of other pyroclastic materials. The lower part of the edifice is composed mainly of lava flows. Recent tephrochronological studies (Miyabuchi et al. 2003, 2004; Miyabuchi 2009) indicate that most of the edifice was constructed at ca. 22–21 ka. Thereafter, the western half of the upper edifice was destroyed by a northwestward-directed horseshoe-like collapse, leaving a 250-m-high collapsed crater wall (Ono et al. 1995). The young volcanic edifice is believed to have been formed during the Holocene, and the youngest pyroclastic cone subsequently arose from inside the young edifice (Ono and Watanabe 1985). The active crater of Nakadake Volcano, formed in the youngest pyroclastic cone, is a composite of seven small craters aligned N-S. Only the northernmost crater (first crater) has been active in the past 80 years, although some others were active before the 1933 eruption (Fukuoka District Meteorological Observatory 1965). The first crater of Nakadake is occupied by a hot, hyperacidic (pH 0.43) crater lake during its calm periods (Miyabuchi and Terada 2009; Ohsawa et al. 2010; Terada et al. 2012) and has maintained a high heat discharge rate of approximately 220 MW (Terada et al. 2008). During active periods, volcanic activity of Nakadake first crater is characterized by gentle release of black sandy ash (ash eruption; Ono et al. 1995). During more active periods, strombolian eruptions have scattered red-hot scoriaceous clasts around the vent. Moreover, the phreatic or phreatomagmatic eruptions that occurred in June 1958, September 1979, April 1990, and September 2015, have ejected coarse lithic blocks that are capable of causing human casualties near the crater as well as generating small, low-temperature pyroclastic density currents (Taneda et al. 1959; Ono et al. 1982; Ikebe et al. 2008; Miyabuchi et al. 2018). Following the 1988–1995 major activity that included ash, strombolian, and phreatomagmatic eruptions (Ikebe et al. 2008), surface unrest of the Nakadake first crater had been mostly mild, except for several small ash emissions through the hyperacid crater lake in 2003, 2004, 2005, and 2008 (Miyabuchi et al. 2008; Miyabuchi and Ikebe 2008). The crater lake began to get smaller, starting on April 2013, and the surface ratio of the lake water to the crater bottom fell to < 10% after December 2013. Then, small ash emissions occurred from the Nakadake first crater between January 13 and February 19, 2014 (Fukuoka District Meteorological Observatory 2015; Ichimura et al. 2018). Subsequently, the crater bottom dried up on July 12, and a vent near the center of the crater has been incandescent since July 28, 2014. A minor eruption that occurred on August 30, 2014, prompted the Fukuoka District Meteorological Observatory (FDMO) of the Japan Meteorological Agency (JMA) to issue, on the same day, a volcanic warning (near-crater warning) changing the volcanic alert level from level 1 (normal condition) to level 2 (do not approach the crater). The Nakadake first crater began a series of magmatic eruptions on November 25, 2014. Relatively, active eruptive events dominated by gray ash plumes (< 1500 m above the crater rim) continued until May 3, 2015 (Fig. 1). Strombolian eruptions intermittently scattering scoriaceous bombs (up to 300 m in height), appeared immediately after the onset of eruptions (Yokoo and Miyabuchi 2015), although they occurred a few months after the beginning of the activity during previous activity (Ikebe et al. 2008). These activities were restricted to vent 141 (designation assigned by the JMA), which was located near the center of the Nakadake first crater. A pyroclastic cone was formed around this vent by the deposition of large amounts of ash and scoria (Yokoo and Miyabuchi 2015). The southern half of the 141 pyroclastic cone has disappeared, probably due to a collapse caused by an earthquake that was felt on May 3 (Fukuoka District Meteorological Observatory 2016). Afterward, a small amount of hot water reentered the 141 pyroclastic cone on June 10, 2015, followed by small eruptions on August 8 and September 3, 2015. The maximum temperature of the water ranged from 80 to 90 °C, and several high-temperature areas of 100–400 °C were observed inside the cone of vent 141 (Fukuoka District Meteorological Observatory 2016). Crustal deformation related to the inflation of the magma reservoir was observed from July 2015 by GPS observation (Ohkura 2018). On September 14, 2015, a phreatomagmatic eruption generated a ballistic ejecta apron and pyroclastic density currents around the crater. The total discharged mass of the eruption was estimated at 7.9 × 104 tons (Miyabuchi et al. 2018). Because of this eruption, the FDMO issued a volcanic warning changing the volcanic alert level from level 2 (do not approach the crater) to level 3 (do not approach the volcano). After the September 14 eruption, intermittent small eruptions produced ash falls. On October 23, two explosive eruptions took place at 02:59 and 06:02 (= UTC + 9) and their ash plumes rose 1400 m and 1600 m above the crater rim, respectively (Fukuoka District Meteorological Observatory 2016). Both eruptions were accompanied by a ballistic fallout, resulting in severe damage to the crater rim area. We first undertook fieldwork in and around the Aso caldera from November 26 to 29, 2014, to examine tephra deposits associated with the 2014–2015 activity of Nakadake first crater. Ash samples were obtained from the surfaces of man-made constructions including roads and concrete floors at 57 sites, and the area from which the samples were collected was measured. Subsequently, we installed 21 ash samplers (polyethylene bucket; 25 cm across and deep, 491 cm2 in area; 2.5 kg weight inside) around the Nakadake first crater on December 2–16, 2014, to separate new deposits from the previous tephra-fall deposits. The most proximal site was the southwestern rim of the Nakadake first crater, and the most distant site was approximately 9 km ENE of the crater (Fig. 2). The sampling interval ranged from one to 15 days (averaging about once a week). The samples were dried, and their masses were measured, and then, weight/m2 (g/m2) was calculated for each sampling point. During some periods until February 2, 2015, we used ash weight data obtained by JMA (5 sites), Kumamoto Prefectural Government (10 sites), Aso City Office (3 sites), and Takamori Town Office (8 sites). Isomass distribution maps were drawn, based on the weight/m2 values at the sampling points in each sampling period. The discharged mass calculation was performed for each period, using the method described in the following section. Samples of the 2014–2015 ash-fall deposits were examined under a polarizing microscope to clarify their components. The samples were washed ultrasonically for approximately 10 min and dry-sieved. Ash grains in the fraction of 3–2 ϕ (0.125–0.25 mm) were set in an epoxy resin to be fixed onto glass slides. Double-polished thin sections of the samples were then prepared for examination. 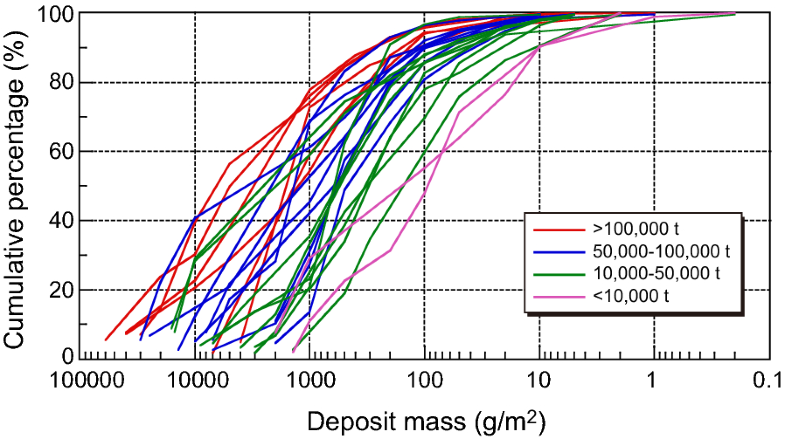 The components of ash-fall deposits are confined to observations of ash grains within the 3–2 ϕ fraction. This is because components of fractions coarser than 2 ϕ to − 1 ϕ (0.25–2 mm) are almost identical to that of 3–2 ϕ. This is true in the case of the September 14, 2015 Nakadake phreatomagmatic eruption deposit (Miyabuchi et al. 2018). The proportions of components were determined by counting at least 200 grains in each thin section. Detailed textural observation of glass shards included in the 2014–2015 ash-fall deposits was also made using a scanning electron microscope (SEM; Hitachi TM-1000). We obtained 28 isomass maps during the November 2014–May 2015 activity of Nakadake first crater (Additional file 1). According to the variations of wind direction during the sampling periods (1–15 days; average 6 days), ash-fall deposits were distributed around the crater with a main axis and a few minor axes. Most main dispersal axes were oriented in the east to south direction (Fig. 3a) because ash plumes were dispersed mainly by the northwesterly winter to spring winds. Although the November 2014–May 2015 ash-fall deposits were mostly observed inside and east of the Aso caldera, the December 9–11, 2014 ash was dispersed southwestward throughout an area extending 20 km from the Nakadake first crater (Fig. 3b). 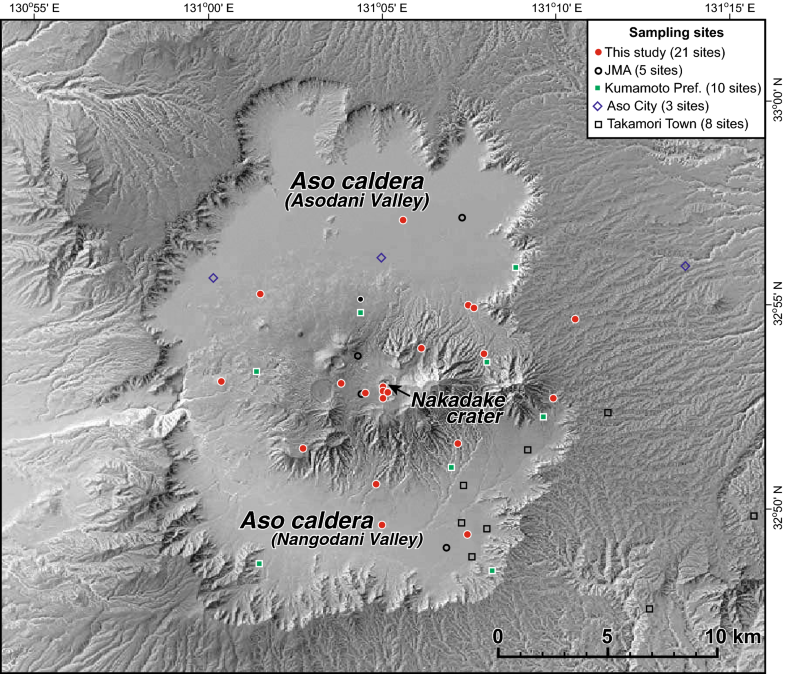 Ash deposition areas of more than 100 g/m2 during most sampling periods were restricted inside the Aso caldera, but during two periods (December 23, 2014–January 7, 2015 and January 7–13, 2015), the areas extended 15–20 km southeast of the crater (Additional file 1). The mass estimates of the ash-fall deposits were calculated from the 28 isomass maps (Additional file 2). 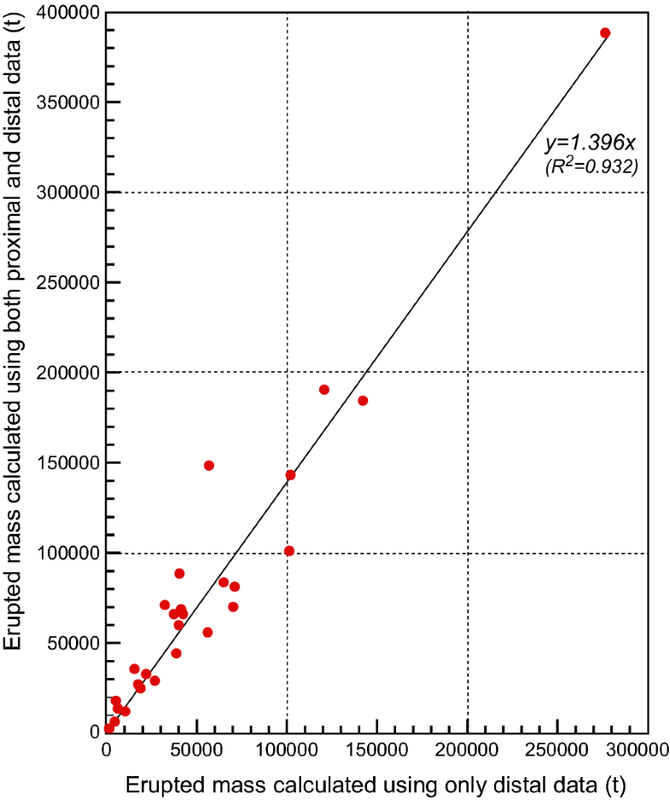 For example, we calculated the total eruptive mass of the November 25–29, 2014 ash-fall deposit using the following method: Plotting their values on a distribution map, eleven isomasses (30,000, 20,000, 10,000, 5000, 1000, 500, 200, 100, 50, 20, and 10 g/m2) were delineated (Fig. 3a). 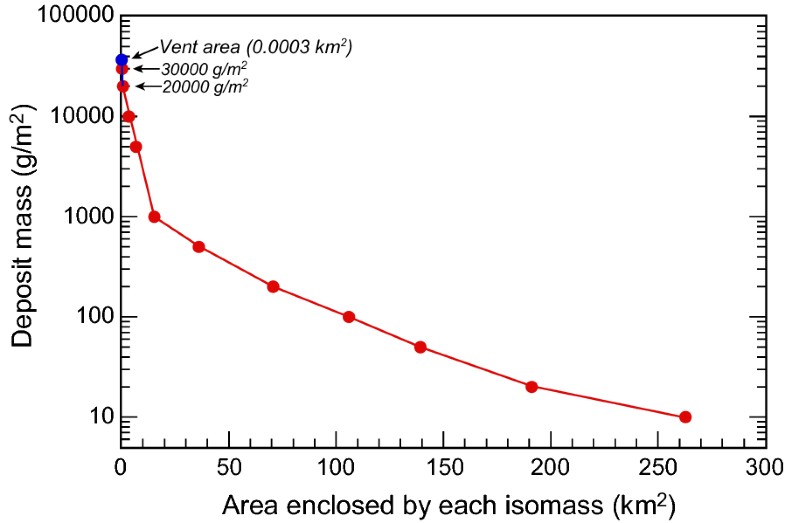 The relation between the area enclosed by each isomass and the mass is shown in Fig. 4. In the proximal area where the ash deposit was more than 30 kg/m2, we extrapolated the straight line that connects 20 kg/m2 with 30 kg/m2 to the area of the source vent (approximately 10 m in diameter). This type of mass calculation was not performed in distal areas where the ash deposit was less than 10 g/m2. The relation between mass and area was divided into 11 sections, and the mass in each section was calculated by integration. This method indicates that the total mass of the ash-fall deposit was about 1.5 × 105 tons, which corresponds to 3.7 × 104 tons/day. 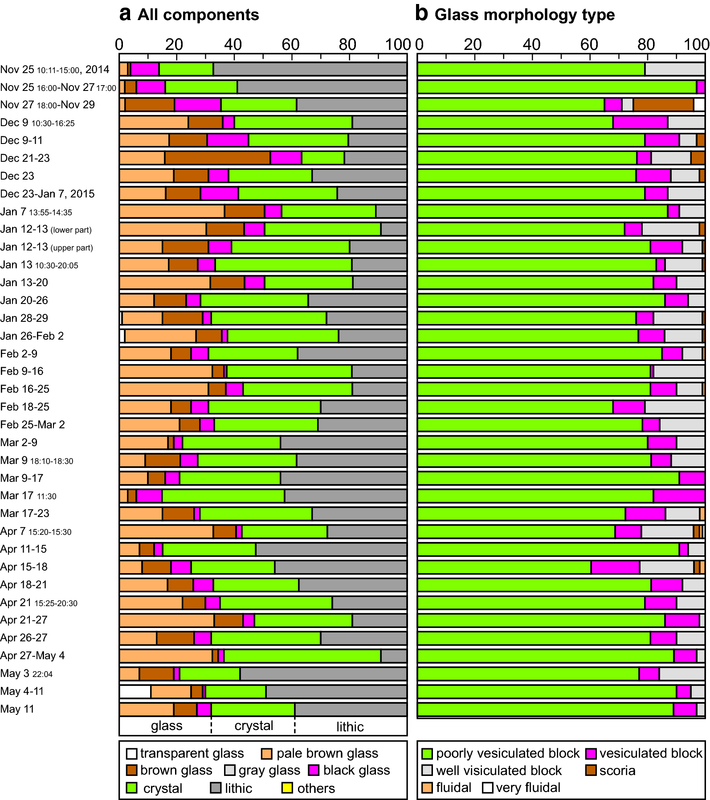 Temporal variation in the mass of tephra discharged from November 25, 2014, to May 25, 2015, is shown in Table 1 and Fig. 5b. Because the sampling intervals differed between periods (1–15 days), the discharged mass data in the figure are denoted as discharge rates (tons/day) which are divided by each sampling period (days). The tephra discharge rate during the first 4 days after the onset of eruption (November 25–29, 2014) was estimated at about 3.7 × 104 tons/day, which was the largest rate during the November 2014–May 2015 activity. Subsequently, the rates fluctuated repeatedly and ranged between 2.0 × 104 and 2.5 × 104 tons/day until the end of January 2015. After February 2, the tephra discharge rates tended to decrease to about 0.3 × 104 tons/day in the period of February 16–25. The period of February 25–March 23 displayed intermediate rates ranging from 0.7 × 104 to 1.1 × 104 tons/day, and the period of March 23–April 21 showed small rates of around 0.2 × 104 tons/day, which were the smallest rates observed during the whole activity. Although the rate increased again to 1.4 × 104 tons/day in the period of April 21-May 4, it abruptly decreased to less than 0.1 × 104 tons/day after a collapse accompanied by an earthquake that was felt on May 3, 2015. Figure 5b also displays the cumulative erupted mass of ash-fall deposits from the November 2014–May 2015 eruptive activity. From November 25, 2014, to the end of January 2015, the cumulative mass increased to a high discharge rate (2.2 × 104 tons/day). After February 2015, it decreased to a low rate (0.6 × 104 tons/day) although the rates slightly rose in March and late April 2015. The cumulative eruptive mass of ash-fall deposits reached about 2.1 × 106 tons until the end of May 2015 (Fig. 5b). The cumulative mass was estimated based on our ash sampling data around the Nakadake first crater, and the value does not include thick tephra deposits that form the 141 cone inside the crater. The size of the cone reached 120–130 m in rim diameter (vent ca. 50 m across) and 30 m in height by the end of March 2015 (Yokoo and Miyabuchi 2015). The volume of the cone including crater floor deposit was 5.0 × 105 m3, giving a mass of 6.0 × 105 tons assuming a bulk density of 1.2 g/cm3 for the Nakadake ash (Watanabe 1991). Therefore, the total erupted mass from November 2014 to May 2015 was 2.7 × 106 tons. 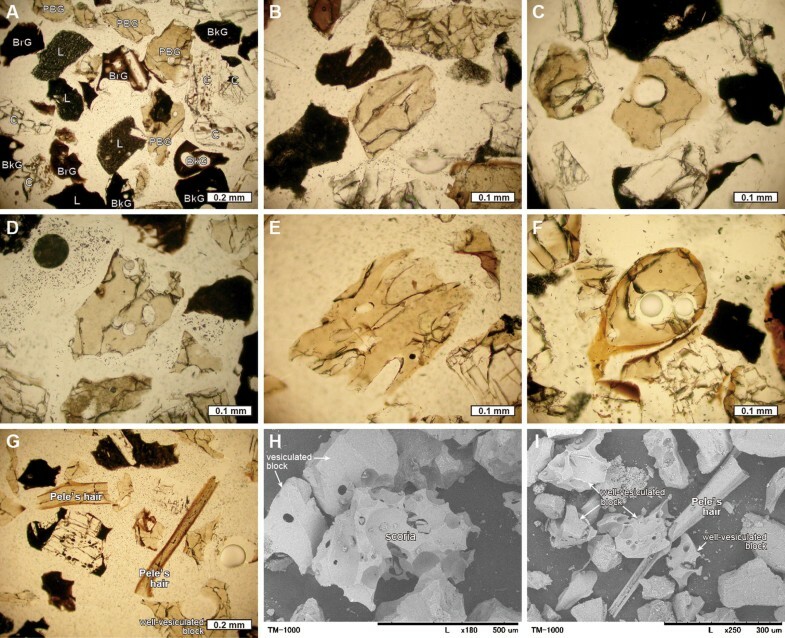 The polarizing microscope observations revealed that all samples of the November 2014–May 2015 ash-fall deposits from Nakadake first crater consisted of glass shards, crystal, and lithic grains (Fig. 6A). The glass shards were divided by color into transparent, pale brown, brown, and black glasses (Fig. 6A). They were also separated by their shapes into block, scoria, and fluidal type particles (Fig. 6B–I), and the blocky glasses displayed varying degrees of vesiculation. The crystals were single phenocrysts of plagioclase, olivine and clinopyroxene. Some phenocrysts had adhering phenocrysts of a different type and/or glassy fragments. Lithic fragments were divided by color into black, brown, pale brown and translucent grains. In the November 25–27, 2014 ash-fall deposits, lithic fragments were dominant with proportions ranging from 59 to 68% (Figs. 5c, 7a). They were moderately to highly crystalized and showed varying degrees of alteration. Therefore, we interpret these to be derived from lavas or pyroclasts of previous eruptions. In contrast, the proportions of glass shards in the November 25–27, 2014 ash ranged from 14 to 16%. After November 27, the proportions of glass particles gradually increased with time, and the December 21–23, 2014 ash contained abundant glass grains (63%). The proportions of glass shards ranged from 29 to 50% until February 25, 2015. Subsequently, they tended to decrease with time and reached 14% on March 17. Afterward, the proportions increased again prior to April 27 and ranged between 20 and 30% in May 2015 (Fig. 7a). The glass shards within the November 25–29, 2014 ash-fall deposits were composed mainly of black-to-brown glass, and thereafter, the proportions of pale brown glass increased with time, comprising 37% of the glass fraction on January 7, 2015 (Fig. 7a). Pale brown glass shards were dominant from mid-January to May 2015, except for the March 9 and 17, April 15–18, and May 3 ash-fall deposits which were rich in black to brown types of glass (> 50%). Overall, poorly to moderately vesiculated blocky glass shards were dominant in the glass fraction from November 2014 to May 2015 (Fig. 7b). In the initial stage, scoria-type glass grains were abundant in the period of November 27–29, and well-vesiculated blocky glass shards were predominant in the December 9 ash-fall deposit. Thereafter, the proportions of moderately to well-vesiculated blocky glass grains tended to be between 20 and 30% of the glass fraction. In the late stage, the proportions of well-vesiculated glass shards increased, and both scoria type and fluidal type (Pele’s tear and hair type) grains were recognized from March 17 to April 18, 2015. To estimate the tephra mass from the November 2014–May 2015 activity of the Nakadake first crater of Aso Volcano, we installed ash samplers at 21 sites, including 4 sites near the crater, and calculated the mass of ash-fall deposits based on 28 isomass maps. During violent volcanic activity, it was necessary to estimate eruptive mass using only distal data obtained outside a 1 km distance from the crater because we could not approach the crater area. The comparison between erupted mass calculated using only distal data (> 1 km of crater) and calculations using both proximal (crater area) and distal data is shown in Fig. 8 and indicates that the latter values are about 1.4 times larger than those derived only from distal data; thus, the proximal eruptive masses extrapolated from distal data are significantly smaller than practically determined proximal eruptive masses. Large amounts of tephra fall not from the upper part but from the lower part of the tephra plume containing ash-sized particles (Mannen 2014), and a large volume of particles derived from the basal part of the tephra plume forms a pyroclastic cone (Mannen and Ito 2007). In addition, voluminous ballistic scoriaceous clasts piled up around vent 141 (Fig. 1b). Consequently, a pyroclastic cone (120–130 m in diameter, 30 m in height as of the end of March 2015) was formed inside the Nakadake first crater by the 2014–2015 activity (Yokoo and Miyabuchi 2015). The average thickness of tephra deposits inside the Nakadake first crater was estimated to be approximately 20 m at the end of February 2015 (Yokoo and Miyabuchi 2015). In contrast, the thickness of tephra-fall deposits at the southwestern crater rim was approximately 25 cm. The difference in deposit thickness between the inside and the rim of the crater suggests a possibility that even observations of tephra fall at the crater rim result in an underestimate of the erupted mass. Figure 9 shows the percentage of deposit mass within each isomass and indicates that 30–80% of the total erupted mass is located inside the 1000 g/m2 isomass, except for a few cases. Furthermore, more than 80% of the mass existed inside the 100 g/m2 isomass in the case of a total deposit mass greater than 50,000 tons. The observation of tephra deposits in as many sites as possible and as frequently and as far as possible is ideal, in order to obtain an accurate estimate of the erupted mass; however, sampling tephra immediately after an eruption is extremely difficult. The present study demonstrates that we can estimate an erupted mass with a certain error if we conduct ash sampling inside the area that receives tephra deposits of more than 100 g/m2 in the case of total deposit mass > 50,000 tons. However, there are reports of distal fine tephra-fall deposits that make a large contribution to the total erupted mass in the case of a plinian eruption (Koyaguchi 1996; Koyaguchi and Ohno 2001). It is therefore necessary to compile and compare as much tephra-fall dispersal data as possible in order to precisely estimate the dispersal of tephra mass. Following the reduction in the size of the crater lake due to rising temperatures from April 2013 and the disappearance of the lake on July 12, 2014, a series of magmatic eruptions began on November 25, 2014, at the Nakadake first crater. The tephra discharge rate of the first 4 days from the onset of eruption (November 25–29, 2014) was estimated at about 3.7 × 104 tons/day, which was the highest rate during the November 2014–May 2015 activity. Contemporary ash-fall deposits were composed mostly of lithic fragments (59–68%) and contained small amounts of glass shards (< 20%). Therefore, almost half of the ejecta (approximately 2.0 × 104 tons/day) produced in the initial stage probably originated from previously erupted materials, discharged due to the opening and enlargement of a vent inside the crater. In contrast, unaltered fresh glass shards contained in the Nakadake ash are regarded as juvenile materials originating from newly ascending magma (Miyabuchi et al. 2008, 2018; Miyabuchi and Terada 2009). Thus, we believe that magmatic materials of at least 0.8 × 104 tons/day corresponding to approximately 20% of the whole eruptive deposits (3.7 × 104 tons/day) were discharged in the initial stage (November 25–29, 2014). Because a fraction of all crystal grains (approximately 1.0 × 104 tons/day; 19–31% of the whole deposit) was derived from newly ascending magma, the magma discharge rate in the first 4 days was likely to range from 0.8 × 104 tons/day (only glass) to 1.8 × 104 tons/day (glass + crystal). In the following discussion, we will estimate magma discharge rates based only on proportions of glass shards, which provide the minimum values. The proportions of glass particles gradually increased until the end of December 2014, and the largest rate of discharged magma during the 2014–2015 activity (approximately 1.6 × 104 tons/day) was recorded on December 9–11, 2014 (total mass of ash: approximately 7.0 × 104 tons). Subsequently, the magma discharged at the rate of 1.0 × 104 tons/day until the end of January 2015 (1.3 × 104 tons/day on January 13–20). JMA observed a gradual increase in amplitude of short-period tremor far before the onset of eruptive activity (from July 2014), and then, the maximum amplitude was recorded in late January 2015 (Fig. 5a). Thereafter, the amplitude gradually decreased. Short-period tremors observed at Aso Volcano have been classified into two types: “isolated tremor” with a dominant frequency around 1–2 Hz and “continuous tremor” with a dominant frequency around 3–10 Hz (Takagi et al. 2006). The isolated tremor occurs beneath the active crater, at a depth of several hundred meters below the ground surface, which corresponds to the upper edge of the crack-like conduit detected by Yamamoto et al. (1999) (Yamamoto 2004; Mori et al. 2008). In contrast, seismic array observations in 1999–2003 (Takagi et al. 2009) revealed that the continuous tremors during dormant periods occur at shallower depth between the upper rim of the crack-like conduit and ground surface. Ichimura et al. (2018) also concluded that the source locations of continuous tremors were distributed from the ground surface to a depth of 400 m beneath the crater before ash-gas emissions in January 2014. According to these observations, it is likely that the continuous tremor represents fluid flow in the uppermost conduit, and the amplitude modulation of volcanic tremor thus reflects the fluctuation in the rate of gas flux at a shallow depth (a few hundred meters below the crater) that is supplied from the underlying magma. Terada et al. (2012) practically demonstrated that the fluctuation of mass flux of high-temperature volcanic gas is consistent with those in the daily mean amplitude of short-period tremors at the Nakadake crater. 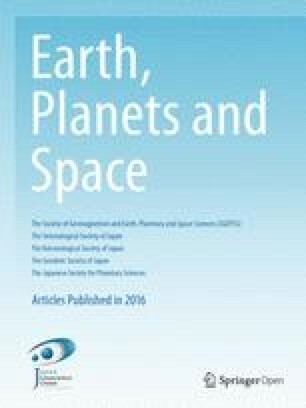 In the case of Sakurajima Volcano (southern Kyushu) that frequently produces ash-fall deposits due to vulcanian and ash eruptions, a positive correlation exists between monthly weight of ash and monthly sum of seismic amplitude (particularly 2–3 Hz tremor) during the 2009–2013 activity (Iguchi 2016). Therefore, temporal variations in both magma discharge rate and short-period tremor amplitude suggest that a high rate of flux of gas and ash was maintained in the shallow conduit below at the Nakadake first crater from December 2014 to January 2015. In addition to the increase in the proportion of glass shards, black-to-brown glass was dominant in the early stage of activity (especially until the end of November 2014), but the proportion of pale brown glass within the glass fraction gradually increased with time, so that pale brown glass predominated after mid-January 2015. The difference in glass shard color reflects varying degrees of crystallinity in glass particles. Black glass, which is highly crystallized, is likely to derive from a slow cooling outer or upper part of the magma column. In contrast, pale brown glass, which contains only rare microlites, appears to have come from a molten inner part of the conduit and resulted from rapid cooling because they are poorly crystallized (Miyabuchi et al. 2018). Therefore, the increase in proportion of pale brown glass suggests an increase in materials originating from molten inner part of the magma column. After February 2015, both the tephra discharge rates and the proportions of glass shards decreased; thus, magma discharge rates also declined to 0.1–0.7 × 104 tons/day. The minimum rates were recorded at a few hundred tons/day from late March to mid-April 2015. However, strombolian eruptions intermittently occurred and scoria- and Pele’s hair-type of glass shards were observed in the same period. This suggests that magma became less viscous due to an increase in magma temperature or that changes in magma composition and/or water content occurred from late March to mid-April, although the magma discharge rates were small. From April 21 to May 4, 2015, the tephra discharge rate temporally increased, with glass shards comprising about 40%. Therefore, at least 0.5–0.7 × 104 tons/day of magma were emitted in that period. The temporal increase in magma discharge probably led to a cavitation in the upper part of the magma column, resulting in a collapse of the crater floor, accompanied by an earthquake that was felt in the night of May 3, 2015. Although very small ash emissions occurred intermittently until the end of May 2015, magmatic activity almost ceased after the collapse event. As mentioned above, the total erupted tephra mass of November 2014–May 2015 activity of Nakadake first crater was 2.1 × 106 tons (1.2 × 104 tons/day). The total mass of magma discharged was estimated at 8.2 × 105 tons, based on the proportion of fresh glass shards within the deposits, which are interpreted as juvenile materials. A fraction of the crystal grains was derived from newly ascending magma, and the lithic fragments also contained recycled materials that had been produced during an earlier period of the same activity; these were stored, crystallized, and altered in the crater bottom and/or inside the active vent and conduit. Therefore, the total mass of magma discharged ranged between 0.8 × 106 and 2.1 × 106 tons. The total amount of ejecta of previous active periods was reported at 3.2 × 106 tons in July–November 1974 (Fukuoka District Meteorological Observatory 1990), 4.6 × 106 tons (5.2–7.9 × 104 tons/day) in June–August 1979 (Asosan Weather Station 1980; Ono et al. 1995), 3.3 × 106 tons (11.7 × 104 tons/day) in November 1979 (Asosan Weather Station 1980; Ono et al. 1995), and 5.7 × 106 tons (4.0–5.0 × 104 tons/day) in June–December 1989 (Fukuoka District Meteorological Observatory 1990; Ono et al. 1995). Therefore, the November 2014–May 2015 activity was smaller in terms of total erupted mass of tephra deposits compared to previous activity going back a few decades. Following the disappearance of the crater lake, a series of magmatic eruptions began on November 25, 2014, at the Nakadake first crater of Aso Volcano in central Kyushu, southwestern Japan, continuing until May 3, 2015. 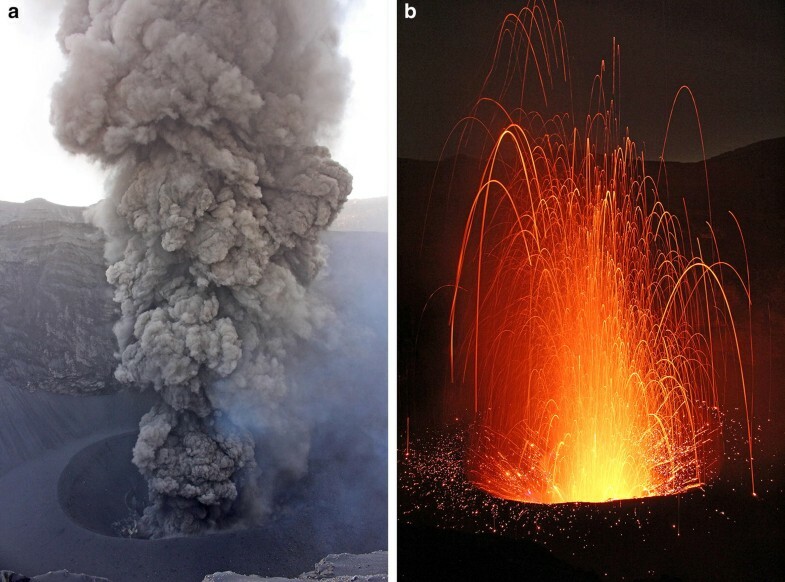 The 2014–2015 eruptive activity at Nakadake first crater was dominated by continuous ash emissions from a vent 20–30 m across (vent 141) formed near the center of the crater; ash emissions were accompanied by intermittent strombolian eruptions producing scoriaceous bombs from the same vent. During previous activity, strombolian eruptions occurred a few months after the beginning of the activity. In the case of the 2014–2015 magmatic activity, strombolian eruptions occurred immediately after the series of eruptions began and formed a pyroclastic cone around vent 141 by the deposition of large amounts of ash and scoria. The total erupted tephra mass of November 2014–May 2015 activity of Nakadake first crater was 2.1 × 106 tons (1.2 × 104 tons/day), which was smaller than those of 1974, 1979, and 1989 activities at the same crater. The present study highlights the importance of continuous observation and sampling of tephra providing dispersal and component characteristics of eruptive deposits. These geological data are necessary to determine the magnitude and style of eruptive activity, and to elucidate the sequence and mechanism of a series of eruptions. Continuous monitoring of tephra deposits and visual observation of eruptive phenomena combined with geophysical observations would provide new insight into magmatic and eruptive processes on long-lasting activities at Nakadake Volcano and other similar basaltic to andesitic volcanoes. YM carried out field surveying and ash sampling, data processing, drawing the distribution maps, and calculating discharged masses of ash-fall deposits. CH observed thin sections of ash samples. All authors read and approved the final manuscript. Parts of fieldwork were undertaken with Hideho Inoue, Daiji Goto, Akihiko Yokoo, Mitsuru Utsugi and Takahiro Ohkura. They provided us valuable information on recent activity of Nakadake first crater and suggested their interpretation. The Aso Summit Office (Aso City) helped our field survey. Ash sampling was supported by Tohru Ogata, Risa Kuwata, Akina Takahashi, Kyohei Kubota, Arata Ichihara, Tsukiko Higashi, and Mariko Hisanaga. Discussions with Nobuo Geshi and Hideo Hoshizumi concerning the ash-fall deposits and activity of Nakadake first crater were very helpful. We thank Mare Yamamoto for providing invaluable advice on volcanic tremors at Nakadake crater. The manuscript was improved by constructive comments from two anonymous reviewers. The editorial assistance of Takahiro Ohkura is also acknowledged. This paper is dedicated to the memory of our wonderful colleague Yasuaki Sudo who researched the activity of Aso Volcano for over 50 years. This study was supported by the Ministry of Education, Culture, Sports, Science and Technology (MEXT) of Japan, under its Earthquake and Volcano Hazards Observation and Research Program (No. 1802). Additional file 1. Isomass maps for each sampling period from November 25, 2014 to May 25, 2015. The numerals show the weight per unit area (g/m2). Additional file 2. Mass of tephra discharged and isomass area for each sampling period during the November 2014–May 2015 activity of Nakadake first crater.